The idea came to me this morning — a theme for my Holidailies posts: Advent in Twenty-Two Objects. I signed up for this annual blog fest as soon as registration opened, aware that I’ve been absent from the blogging community for months, that I probably don’t have much of a readership left, that the platforms and the techniques I’ve always relied on to maintain my presence have changed dramatically and I have much to learn. As I have changed as a writer and a reader. But as everyone’s first pieces began to appear today, I felt the way I often do at the twice-yearly gatherings of my high school classmates. I saw names, both of people and journals, I have been out of touch with for too long. Let’s start again, I want to say. So I’ll start, without much preamble, and only a little introduction: I’m a long-time blogger, almost 72, a fiction writer, a memoirist. When I began this endeavor almost twenty years ago, I was trying to navigate the change from full-time teacher with an active middle-schooler to care for to “stay-at-home mom,” a phrase that didn’t seem to fit me well at 52. At 72, I am more confidant calling myself a full-time writer, and the middle-schooler is a working mother of two. But I am still navigating change — my husband and I have seen each other through some health challenges and we live two hours from the daughter and grandsons we adore. I haven’t mounted a traditional (for me) Christmas since 2012, but I still love many of the objects and the observances that meant so much to me earlier. Advent begins tomorrow, the season of hope and watchful waiting, and of remembering. Look for pictures of objects retrieved from where they’ve been hidden, and a paragraph or two about the meaning they hold. For today, this object, encountered in the supermarket. Say hello to Marty, a robot that appeared suddenly like a Roomba with a long neck. 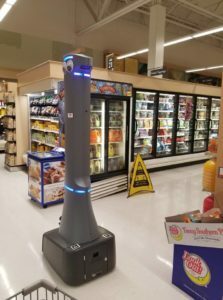 It doesn’t sweep, it merely roams the store, beeping and, I’m told, looking for spills that it can inform the maintenance staff about. For the busy shoppers trying to collect what they came for and get home, it/he was more of a distraction and a hindrance than a help. But he/it reminded me to slow down, smile at his googly eyes, and enjoy the moment with the others rushing by. This entry was posted in Holidailies 2018. I love your idea for a theme, and it’s good to revisit your blog. “The season of hope and watchful waiting,” yes. That. You know, in the midst of fears about runaway AI or killer robots or automation taking away our jobs, a gloriously useless robot with googly eyes is a nice change of pace. Or it’s lulling us into complacency. I was struck in your introduction to your flashback to 20 years ago and that transition, no doubt because I’m in my own transition (or temporary condition?) from teacher to stay-at-home dad (with our 2-year-old), and navigation is hard.